LOCATION.--Lat 44°27'05", long 73°38'33" referenced to North American Datum of 1983, Clinton County, NY, Hydrologic Unit 04150404, on left bank 1.8 mi downstream from confluence of East and West Branches, and 1.8 mi east of Au Sable Forks. PERIOD OF RECORD.--August 1910 to September 1968, March 1990 to current year. Prior to October 1924, published as "at Au Sable Forks". Monthly discharge only for winter periods during 1911 and 1913 water years, published in WSP 1307. REVISIONS HISTORY.--WSP 1307: 1911-19 (M), 1922-24 (M). GAGE.--Water-stage recorder and crest-stage gage. Datum of gage is 505.65 ft above NGVD of 1929 and 505.37 ft above NAVD of 1988. Prior to Oct. l, 1924, nonrecording gage at site 1.5 mi upstream at different datum. REMARKS.--Minor storage in several lakes in the headwaters of the basin. During the 1920s to 1950s, flows could have been affected by operation of a hydroelectric plant (Nye Dam) near Upper Jay. 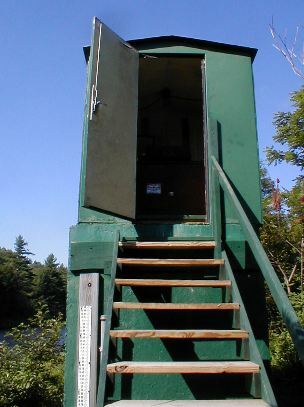 Storage in Taylor Pond in the Black Brook basin; formerly regulation due to hydroelectric plant at site (dates unknown). Regulation from pulp and paper mill operations at Rome Dam, 3.2 mi upstream on the West Branch, from 1893 to 1971. EXTREMES FOR PERIOD OF RECORD.--Maximum discharge, 46,500 ft³/s, Aug. 28, 2011, gage height, 15.54 ft, from rating curve extended above 16,000 ft³/s on basis of runoff comparison of peak flows from contracted-opening measurements at gage heights 13.83 ft and 15.54 ft at site 3.9 mi downstream; minimum discharge, practically no flow July 21, 1912, result of unusual regulation. EXTREMES OUTSIDE PERIOD OF RECORD.--Flood of Feb. 23, 1990 (ice jam), reached a stage of 14.5 ft, from floodmark 200 ft upstream from gage.